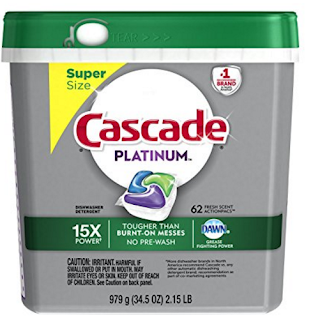 Run over to get this Cascade Platinum ActionPacs Dishwasher Detergent, Fresh Scent, 62 count for as low as $8.94 when you clip the $5 coupon and subscribe and save! This makes each pac just $0.14 each. This item ships FREE with Subscribe and Save. When you select Subscribe and Save you the product will be delivered every 1 to 6 months (you choose the interval). If you have 5 or more subscriptions arriving in a month you save an EXTRA 15% off your order (instead of the regular 5%). To manage your subscribe and save orders go to "my account –> subscriptions." You are under no obligation and can cancel before the next shipment arrives. Keep in mind prices can change at anytime!